ANNVILLE, Pa. - Lebanon Valley College rising senior Frank Gaffney has made his fourth preseason all-America list of the summer, this time from Beyond Sports Network. Gaffney, who was a BSN Second-Team All-American last year, earned a spot on their first team for the 2014 preseason. He has also been on preseason lists by USA College Football, theSporting News, and Lindy's this summer. Gaffney will look to repeat his standout junior season that saw the Dutchmen (8-3 in 2013) win the Middle Atlantic Conference title and qualify for the NCAA Tournament. Elected a captain for 2014, Gaffney is coming off a dominating first season in the blue and white after transferring from two-year Thaddeus Stevens. The consensus all-American was a finalist for the Cliff Harris Award, given to the nation's top small-college defensive player, and was the MAC Defensive Player of the Year, D3football.com First-Team All-East, and a three-time D3football.com national team of the week member. 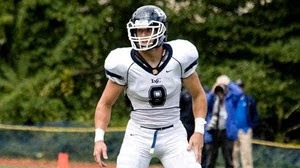 He led NCAA Division III with 13.0 sacks, an LVC season record, among his 19.5 tackles for a loss overall. He led LVC with 82 tackles, including 63 solo stops, and broke up three passes with five hurries. He recorded three games with three or more sacks, including four hits against Wilkes and three against nationally-ranked Lycoming. Lebanon Valley's season begins Sept. 6 at Franklin & Marshall, renewing an old rivalry that hasn't been played since 1982. The Diplomats feature a BSN preseason all-American of their own in punt returner Jordan Zackery.